Specimen signatures Pao-Serm UNC about 1,770,000 baht. Specimen without signatures without drilled print "SPECIMEN DE LA RUE & CO. LTD CANCELLED" in ellipse circle UNC about 830,000 baht. 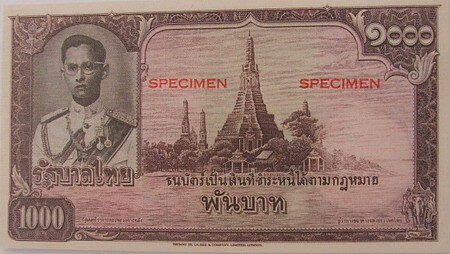 In 1949, the ministry of finance permitted the bank of Thailand to place an order with Thomas de la Rue for 1000 baht banknotes. These notes arrived in September 1952. 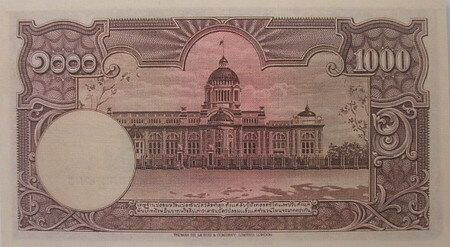 The bank of Thailand proposed to the ministyr of finance to announce for issuance of the notes but met with opposition, reasoning that these notes would cause inflation. Later, these notes were not issued and demolished. Some of 1000 banknotes that are found ussually are specimens. But there are some notes with signatures. They were also claimed as specimens. The main object is the temple of dawn. The image of King Rama 9 in full regalia is at the upper left corner.